While countries around her fell to Japanese forces, Thailand retained her sovereignty through World War II and was given control of the four northern states of Malaya by the Japanese in return for cooperation. On 1 October 1944, a motley selection of stamps in Thai-occupied Trengganu was given an overprint of the letters trengganu, applied at the Trengganu Survey Office by order of State Secretary Tengku Wansa (Gallatly 1962c). This served to identify the point of origin of the many different British- and Japanese-issued base stamps that were being used in the state. See Chang (2014) for some historical background and a taste of the mysteries surrounding the overprint. Illustrations can be found in Tsuchiya (1999) and Lin & Cheah (2016b). The overprint, probably impressed by metal type put together by hand in a letterpress printing room, is of a bold Grotesque typeface with characteristically uniform stroke width ideal for headlines or advertising. The letter R has a curled right leg common in this class of typeface. Good typographical practice is evident in the expanded letterspacing which makes easier reading of all-uppercase words (Lin & Cheah 2016b). 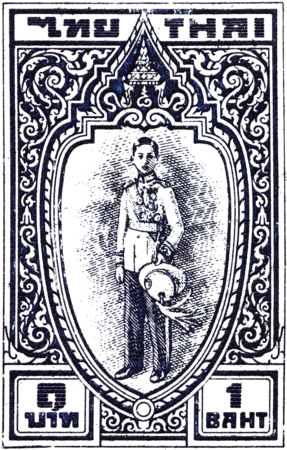 Part of a forgery suspected to have been made with a rubber stamp. 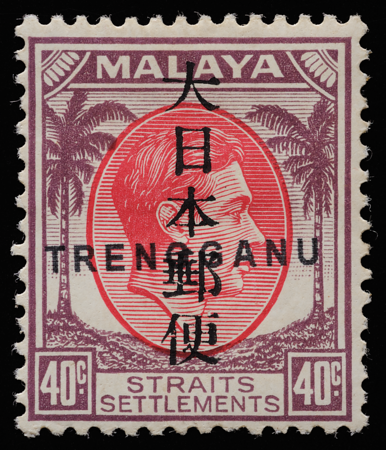 The trengganu overprint is one of the most elusive overprints from the war years. Pair this fact with its simplicity and ease of imitation, and we have a fertile breeding ground for forgeries. Most common are those made with rubber stamps (above); see Lin & Cheah (2016b) for a detailed typographical analysis. There was even one in a serif font apparently made with a typewriter (Gallatly 1962c), and the brazen high-tech number described below. 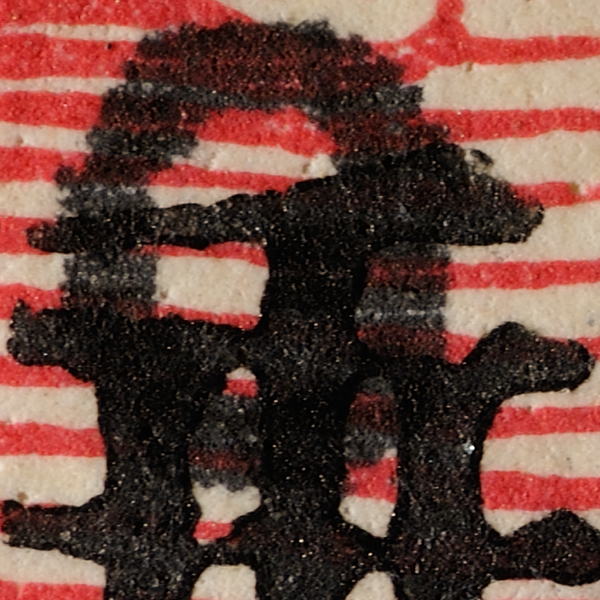 This example carries the Kanji overprint that was subsequently added to with a fake digital trengganu overprint. The overprint is too precise and too light in font weight. In fact, the typeface itself is not quite right, discrepancies being particularly pronounced in the r and g in comparison with the earlier illustration. For more guidance on identifying forged type, see Dehn (2003). Among the most striking anomalies at high magnification is the presence of horizontal lines within the strokes of the letter. Another hallmark of digital printing is apparent: the sloping edges of the letters have the stepped appearance of staircases. This, known as aliasing, is a classic syndrome of digital printers, probably an inkjet in this case, trying to render oblique lines. The author has uncovered a similar forgery of the BMA MALAYA overprint in the collection of a fellow philatelist. The differences between digital printing and letterpress printing are obvious where the forged overprint comes together with the genuine letterpressed Kanji impression. 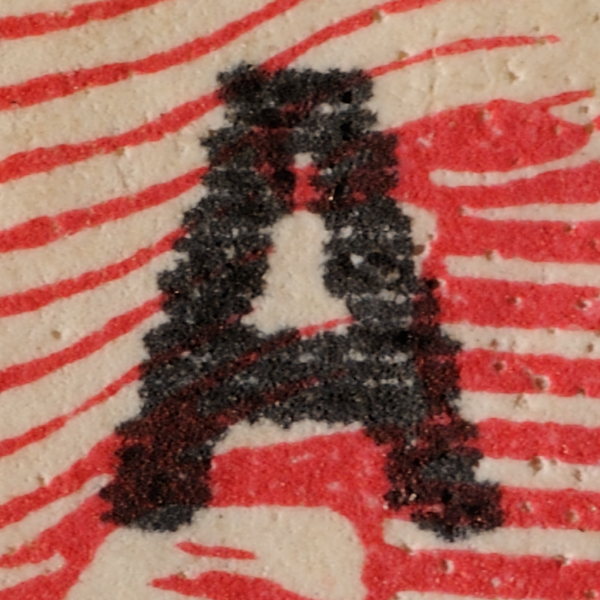 The letterpress print is free of the aforementioned digital artifacts, and exhibits the characteristic thickened outlines of ink squeezed out from underneath the printing surfaces. Although today's electronic printers can produce impressions that look almost identical in shape to the real thing, they cannot yet fake the letterpress effect. There may yet arise, or already exist, more sophisticated forgeries as technological advancements become increasingly cost-effective. For example, we are nearing, or have already arrived at, the point where a 3d printer could generate a physical handstamp that replicates an overprint with high precision and realism. Three-dimensional nanoimprinting may even be able to imitate the letterpress effect directly, although the technology is not yet economically available. One can only hope that cutting-edge forensic science (e.g. Klein 2006, Feddersen 2007) will stay ahead in the 'arms race' and remain capable of distinguishing real and fake, allied with more traditional methods like provenance (Verge 2001), corroboration with history and postal rates (e.g. Norris 1988, Wade 1997, Mikulski 2000, van der Linden 2006) and ascertainment of the contemporaneity of postmark and overprint (e.g. French 2000). Lin (2016a) makes a case for collecting and studying forgeries. Japanese occupation overprints can be exhilarating and exasperating. As the war recedes further and further into the past, verified collections are dispersed, and those with first-hand knowledge of the stamps gradually pass on, future collectors may face a bleak horizon upon which these timeless gems of cultural dissonance are slowly drowned out of existence in a sea of forgery.